What is breathing? Since it is impossible to stop breathing long enough to examine it closely, most people do not understand the proper way to breathe. In Oriental Medical theory, it is a common belief that the body follows the mind and the mind in turn follows the spirit. In reverse, breathing affects not only the body but also the mind and one's emotions as well. For example, short and fast breathing makes one irritated whereas long, deep breathing allows the organ systems to rest and work calmly as they were intended. As one begins to feel angry, frustrated, and feel like letting off some steam, it is recommended to take a few deep breaths to regain one's composure and balance. Breathing controls one's emotions, consciousness, and physiological functions. There are six types of breathing - mild, rough, cold, hot, dry and wet. Usually, it is common for chronically sick patients to display abnormal and uncomfortable breathing patterns. But if a patient controls his breathing patterns his immune power can be stimulated, allowing his natural, spontaneous healing power to arise. To begin properly, the patient's body and mind should be thoroughly relaxed. In this relaxed state it is much easier to cure an ailment by allowing energy to flow freely to and from the deficient system whether it is the skin, lungs or stomach, etc. To attain the full benefits of breathing one must make an effort to do it consciously at all times. Fully become aware of your breathing in everything you do. As you inhale through your nose, it expands your belly and pushes outward and drops the diaphragm down, filling the lower lungs with air. As you exhale, your belly should decrease, gently squeezing upwards and inwards with the bowel, upper pelvic and diaphragm muscles allowing the air to comfortably and slowly exit through the nose. In Oriental Medical theory, the belly is the most important part of one's body as it is closest to the source of life: the tanjon (the ocean of Qi energy). Oriental doctors believe that the tanjon (which is approximately five centimeters below the navel and centered inside the body) is the source of one's life. The patient who improves the power of his tanjon can cure many difficult diseases. During breathing, therefore, it is best to concentrate one's consciousness on the tanjon. Most people have had some cough or lung-related illness at one time or another that didn't allow them to sleep well at night. The next morning, they may have felt tired or drained even though they slept for eight hours or more. This is directly due to the lack of relaxed, gentle breathing necessary for one to attain the deep alpha and delta sleep levels. Most patients' breathing is unbalanced - either too mild, rough or short - which prevents their immune systems from controlling the onset of disease and illness. 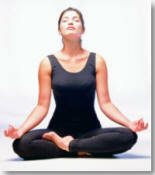 To practice natural, full breathing the body should be relaxed, allowing the mind's equilibrium. Patients must try to forget and decrease their fears that the disease won't and cannot be cured. Natural breath control can calm all excessive emotions and strengthen the immune system so much that you will rarely become ill. Practice daily for a few minutes and see the difference. By Jaseng Center for Alternative Medicine.